on vessels to widen their range of action, it may be used to monitor and detect endangered boats, assemble and deliver rescue kits, in the first phase of SAR procedures. 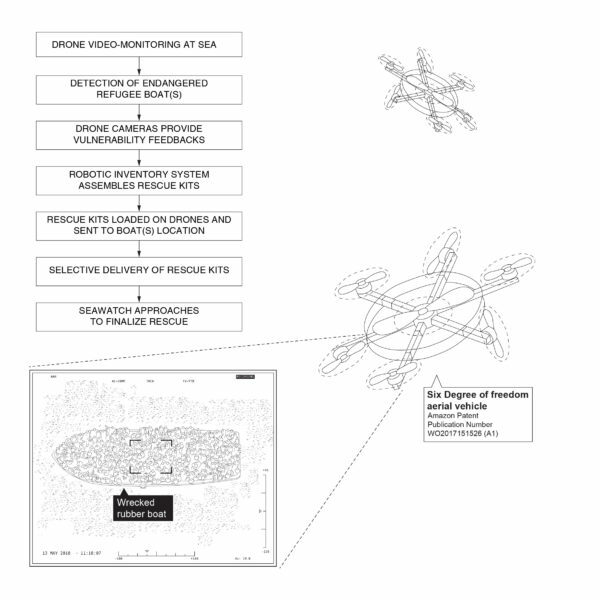 Drone video monitoring may be realized by six degree of freedom aerial vehicles, equipped with selective high resolution video monitoring devices, which may identify endangered boats and report their urgent needs according to the detected conditions (life vests, drinking water etc.). In the vessel’s cargo holds, within the workspace of an inventory management system, mobile robot manipulators and robotic tossing arms may assemble the needed items into rescue kits, specially composed for the detected emergency. 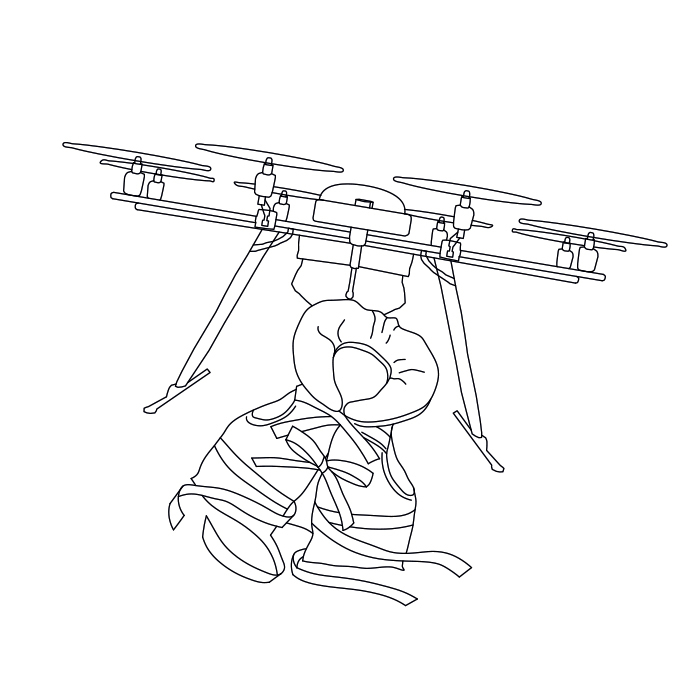 The kits may be moved to a multi-level fulfilment center and further loaded onto the delivery vehicles; the center accommodates landing and takeoff of the vehicles, in case of smaller vessels, a lighter docking station may be directly incorporated to the higher parts of the ship. 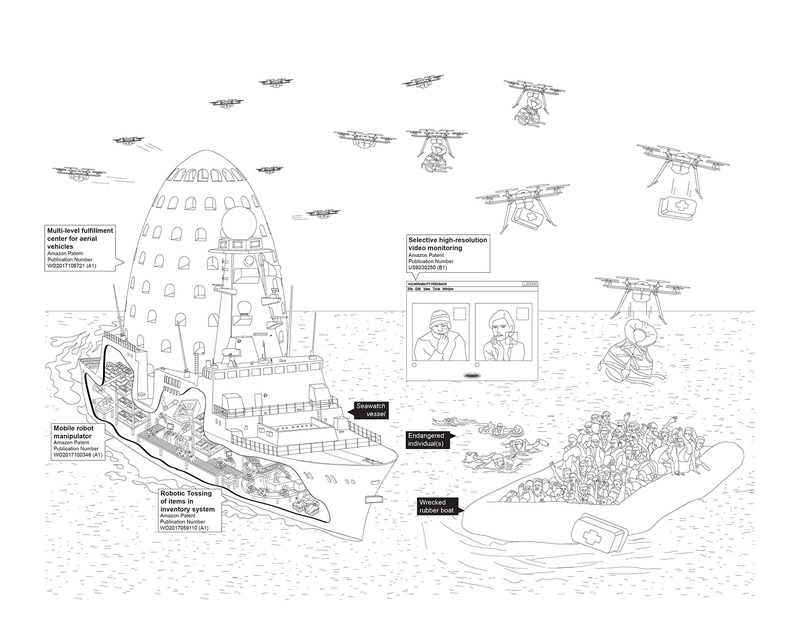 When loaded, six-degree-of-freedom-aerial vehicles may depart from the center, reach the endangered boat and deliver the rescue kits, providing a first aid before the arrival of the vessel itself and the finalization of the rescue procedure. In 1818 Theodore Gericault narrates of the sink of the French Navy Medusa and paints The raft of the Medusa, when only few members of the crew survived, after having spent in the sea several weeks. Gericault was not simply referring to an event, but rather to a wider condition that France was undergoing, the wreck was not only of the Medusa, but that of a country at the end of the Napoleonic Age. Somehow similarly, what happens in the Mediterranean Sea today goes beyond physical events and tells about a whole European condition. The Gericault system shifts the use of certain technologies, intervening in the core moment of research and rescue.